There’s a meme out there that reads Practice Safe Design: Use a Concept. I’ll pause while you chuckle at that. Or at least while *I* chuckle at that. I’d take it one step further and say Practice Good Design: Use a Professional. It’s less funny, but still the best advice I can give someone who asks me how they can make their design pieces look good or better. Because it’s blindingly obvious when you DIY design. I don’t just mean to the design community, or people who do visual arts for a living. I’m talking about everyday people, the very people you are likely trying to attract with your business and turn into clients or customers. Like it or not, that first impression that you make on them is probably with design: your logo, your website, your storefront. And if something is off or really not done well, it will turn people away. Basing design off of personal preferences instead of your target audience/market. 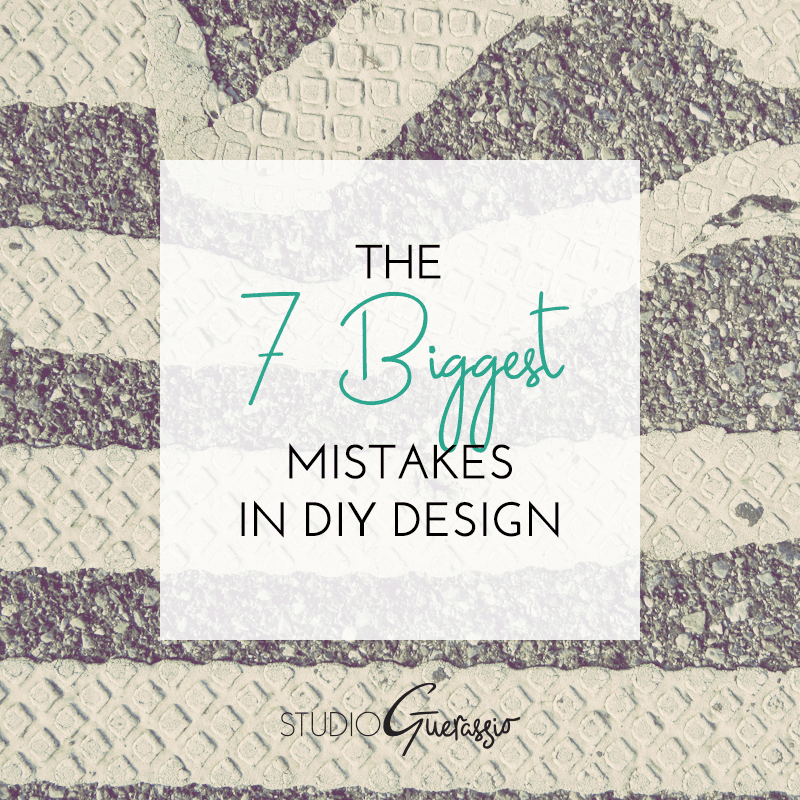 This is by far the #1 mistake I see business owners make when they DIY design. I wrote a whole post about this, but the short of it is that you as the business owner are likely not your ideal customer or target, so what you personally like shouldn’t be the guiding star of your design. You’re not trying to appeal to yourself. Going crazy with Photoshop effects. Yes, Photoshop can do amazing things, and yes, the Effects panel is part of that. 9th grade me sympathizes with you. But it’s one of those cases where you really shouldn’t touch it until you have some training. And even then, it should be used sparingly. I promise your design doesn’t really need a ton of drop shadows, glows, and gradients. Not understanding resolution and file setup. Newsflash: files need to be set up differently depending on whether you’ll be using the piece on the web or in print. I can’t tell you how many times I’ve seen people use something of low resolution that’s meant for web in a print piece, because there wasn’t a designer there to tell them how pixelated and awful it would end up looking. Don’t let this be you. Too many fonts / novelty fonts / lack of type hierarchy. In other words: not knowing how to properly use fonts and treat type. If you’re set on DIY design, keep your font selections simple and few, and break your text into clear sections. There’s a reason Helvetica is a design pillar, and a reason the headline-subtitle-text tier is the standard. Lack of attention to white space. Nothing will out you faster as an amateur in design than things that don’t align properly or crowd the edges of your piece. Particularly in print, but also on the web (though there is some leeway on the web because of different browsers, screen sizes, user settings, etc.). All of the parts of your design should have room to breathe, and have a consistent alignment system. Copying / using something already out there. Technically this isn’t DIY design; this is plagiarism. And if I really need to go into why this is bad and wrong, maybe you shouldn’t be running a business? There are plenty of sites that offer both photos and vectors that are free for commercial use. You don’t need to steal something that is still under copyright. Not adhering to brand standards after a designer hands it over. If you actually hired a designer to get your basic design needs set up before switching to DIY design, you’re a step ahead of most business owners. Now don’t go ruining it by throwing that work you paid for out the window! If the work the designer did for you included a brand manual or brand standard- use that! It lays out all of the visual guidelines for your new brand; it’s very existence is meant to make it easier for you to manage your brand going forward. Why on earth would you ignore it and lose brand consistency? I’m guessing that at least some of these weren’t a surprise to you, because it is apparent when a professional designer wasn’t used. Maybe you saw a piece of design out in the world and thought it looked not quite right, but couldn’t put your finger on it. Or maybe you just saw something that looked terrible. The culprit is likely one (or many) of the above. Are there more than these seven things that could be on this list? Absolutely. But, to me, these are the biggest ones, and the dead giveaways for when someone without design experience was in charge of a piece. If you can avoid them, you’ll be in decent shape. (This may help, too). Ok, fess up non-designers: have you committed any of these DIY design crimes?